AK Patterson opens tonight with a sparse guitar, double bass and clarinet arrangement. She contorts and grimaces, as if merely a conduit to the infinitely soulful voice that escapes. Not a note out of place and not a pin drop to be heard from the crowd. “She’s mint” whispers a kid quite loudly behind my head, “can we go back stage?” He asks his parents with his luminous green ear protectors on. No need, I caught her in the lobby and she is indeed mint, She’ll be returning to Newcastle’s Think Tank? On Saturday 26th January. 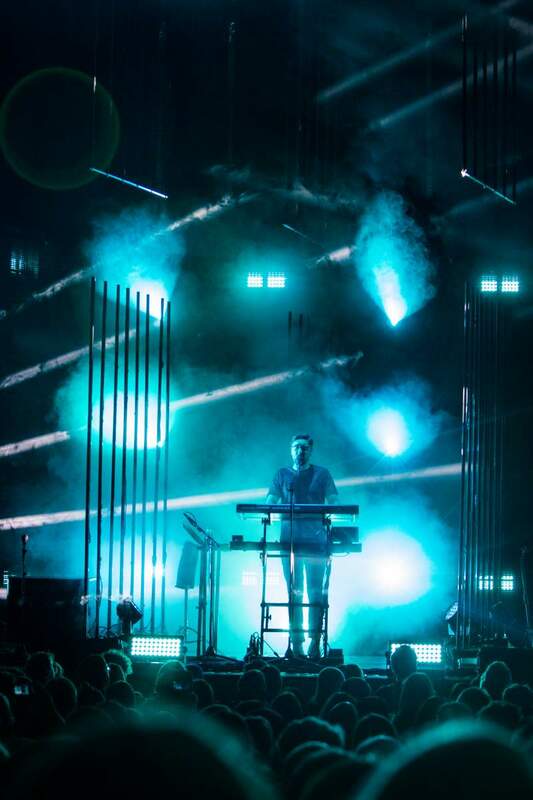 Alt-J walk on and fill three spaces caged at all angles by black strips of lights. Opening with Something Good they’re reserved, but the intention becomes clear as a phenomenal coalescence of light and sound takes place. Strobes and LEDs dance, stutter and swim across the stage, elevating each track immensely. Perfectly choreographed the show may be, it seems a little impersonal, after the fifth track the band break their silence. “Thanks Gateshead, how are you doing this evening?” Everyone cheers louder than after any song so far. People seem stuck between respectful observers and active participants, the seated arrangement and minimal crowd interaction makes for a bemusing atmosphere. During Taro the first dancing breaks out way up on the balconies. The band drop in a couple segments from their recent remix album Reduxer, adding some rap/trap energy that gets heads in the front nodding. The balance tips for good during Fitzpleasure, the belligerent synth bass compels a guy to his feet in the middle of the bottom floor seating. Following the singer’s eye line and wry smile I catch the rebel’s friends make the decision to join, dancing like they’re in a club all down the aisle. “I believe some standing up is going on, anyone else want to join?” the whole place rises, freed of the venue’s pressure and for the remainder everyone’s let loose. There’s a “Well done mate” from the keys player to the one guy who seems to have completely flipped the venue’s energy. Alt-J stray from the script for the first time with little improvisations on tracks like Left Hand Free and during closer Breezeblocks the singer laughs through the first line as the crowd’s singing can be heard loud and clear. They leave the stage seeming equally exhilarated by the transformation tonight.